We all do it, whether once a week or every single day, it's very alluring to hit the snooze button when the alarm goes off in the morning. While most of us think the extra few minutes will give us more time to wake up, we don't know that it does more harm than good. It's a psychological crutch. People at ASAP Science have explained that while you might be thinking that hitting the snooze will give you a chance to finish your sleep and wake up feeling rested, nobody really knows what happens. Instead, after you hit the snooze and fall asleep, your brain starts its sleep cycle all over again. What happens when the alarm goes off a second time is that you are very likely to enter an even deeper part of your sleep cycle, which results in you feeling worse than you did the first time. If you regularly wake up feeling bleary, ASAP Science explains that the trouble may be that your alarm is going off at the incorrect part of your sleep cycle. You should try setting your alarm a few minutes later or maybe even getting up a little earlier and following a regular sleep schedule to get a good rhythm going. • Set a timer so that a vivid light turns on simultaneously with your alarm. When the light hits your face, you will be less likely to fall asleep, even if you keep your eyes closed. • Put your alarm clock on the other side of the room. By keeping it on the other side, you have no choice but to answer it and before you know it, you're out of bed. 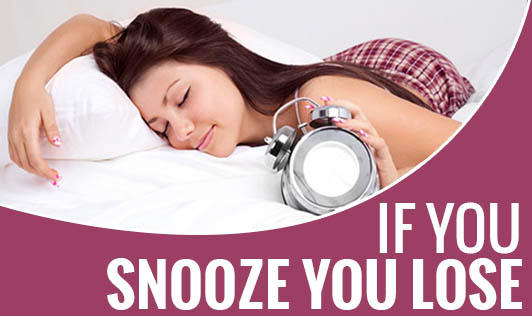 • Consider gluing your snooze button in order to make it impossible to use.